Strategic Planning: What’s the Lifetime Value of Your Customers? Just how valuable are your customers? A strategic planning calculation called the lifetime value of a customer translates value into hard dollars. The outcome of this calculation represents a relatively accurate estimate of your customer’s value to your company over the lifetime of that customer’s business. The lifetime value of a customer calculation (illustrated in the figure) doesn’t determine profit but rather the overall customer value that can eventually be realized in the best-case scenario that a customer stays with you forever. What’s the average sale or amount of money a customer spends per month? Add up your total dollar sales for a year and divide that by the total number of sales transactions you completed. I recommend using the average sales of your 80/20 customer. How many times a year does an average customer buy from you? Estimate the frequency of purchase of a normal customer. A typical grocery store customer probably shops 52 times per year, whereas a consulting company may do only one project per year for an average client. What’s the expected number of years a customer will use your services or buy your products? The expected number of years is unique to each company. Think about how long you anticipate maintaining relationships with the majority of your customers. This configuration will give you a good number to work with. How many people per year does your average customer tell about your company? You may have to make a guess here, but the answer is probably between 3 and 12. Generally, the better your customer service, the higher this number is. What percentage of these people actually become customers? The average is usually between 20 and 70 percent. This range is pretty large, so pick a percentage that you feel comfortable with given your industry. What’s the lifetime value of your average customer? Using the formula in the example in the figure, calculate the lifetime value of your customers with and without the impact of referrals. 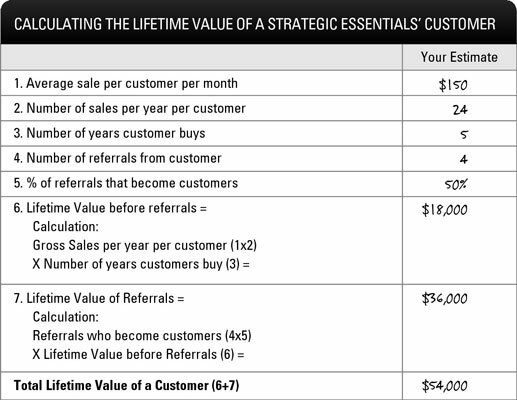 The example in the figure shows you how Strategic Essentials, a personal coaching business, applies the lifetime value of its average customer calculation. If each coaching session is $150 and the average customer has two sessions a month, gross sales per customer are $3,600 per year. Estimating that a customer stays with a personal coach on an average of five years, the lifetime value of this customer, before referrals, is $18,000. Customers that see results from personal coaching will more than likely tell their friends. The power of positive word-of-mouth magnifies the value of each customer. Conservatively estimating that each customer tells four people, and 50 percent of those referrals, or two people, become customers, the gross sales from referrals is $36,000. Therefore, the total lifetime value of a customer is $54,000 (the gross sales per customer plus gross sales from referrals). Wow! Doesn’t that change the importance of a $150 per hour client? Whether your lifetime value figure is three figures, six figures, or more, producing a concrete dollar figure gives you a tangible point around which to design customer strategies. Step up satisfaction. Now that you can see the importance of customer satisfaction in cold, hard cash, you want to step up the level of customer contentment. Satisfied customers lead to loyal customers, and loyal customers lead to referring customers. Support the customers who refer business to you. The impact of positive word-of-mouth has a multiplying effect in the lifetime value calculation and also in the marketplace. Hang your lifetime value of a customer number in your break room. Make sure that everyone understands the value of your customers. Keep this number in mind when you’re dealing with disgruntled customers or prioritizing your daily activities. Cut out any activity that signals indifference to your customers. These activities send your clients packing. You know indifference when you’re on the receiving end. Examples include sitting on hold for longer than you want to, delayed replies to e-mails or voice mails, lack of follow-through, and general carelessness.